Last night I was home, rather than going to my schools' Sadie Hawkins dance. None of the boys at my school are up to my standards....as far as I can tell right now. So I baked cupcakes. I used the recipe for cherry vanilla cupakes from Cupcake Bakeshop, only I didn't have any vanilla. I had mapaline, and lemon extract, BUT NO VANILLA (note to self: add vanilla to the grocery list). I also didn't want to fill them (out of lazyness). I looked in my fridge and found a bag of oranges! 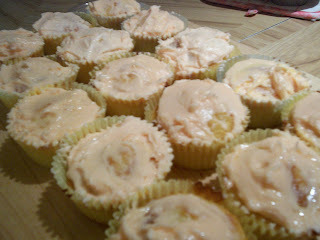 Then for the frosting, I wanted to stay with the citrus thing, so I made lemon-orange frosting. Here's what I came up with. 2 teaspoons juice from said orange (You can drink the rest, or use it in the frosting. Freshly squeezed orange juice is really good). Beat butter until soft. Add sugar. Beat on medium-high until light and fluffy. Add eggs one at a time, beating in between. Whisk together flour, baking powder, and salt in a separte bowl. Add to mixer along withmilk, orange zest, and orange juice. Mix until combined. Fill cupcake papers half to two-thirds full. Bake at 350 for 22-25 minutes until a toothpick inserted in the center comes out clean. It only took my 18 minutes for 6 cupcakes in my toaster oven (my normal oven is out of whack). Frost with lemon orange frosting (below). Sift powdered sugar. Beat butter until creamy. Add half of the sugar, the orange juice, lemon juice, and the milk. Beat until combined. Add the rest of the powdered sugar until you get a good consitancy. Spread on orange cupcakes. Enjoy! If you come up with a better slogan for my blog (I changed it - did you notice? ), or even a better name, let me know!